The 2011 season has been a very perplexing one for the Yankees’ offense. Although the team’s lineup has looked futile on so many individual occasions, the aggregate numbers still suggest it is one of the best in baseball. Almost 50 games into the season, the Yankees not only lead the league in runs per game, but the lineup has also posted the most homeruns and the second highest wOBA. And yet, something still does not feel quite right. Perhaps one reason it seems as if the Yankees have been struggling so much is because the team got off to such a quick start with the bats. In other words, although the lineup’s recent output hasn’t fallen too far behind the rest of the league, it has significantly lagged its earlier performance (not to mention preseason expectations). So, what short circuited the Yankees’ offense and when did it occur? Segmenting a sample can often lead to a misleading analysis, but the tenor of the Yankees’ season seemed to change on April 25 when the team returned home for a four-game series against the White Sox. In that game, the 12-6 Bronx Bombers, who were leading the league with a whopping 6.1 runs/game, were opposed by journeyman Philip Humber, so the natural expectation was a blowout. However, the Chicago righty not only kept the Yankees from scoring a single run, but he also no hit them for 6 1/3 innings. Since Humber’s masterpiece, the Yankees’ offense has fallen off considerably. Not only has the lineup’s per game run production dropped to 4.6, but most relevant metrics have taken a dip as well. Although it’s worth mentioning that the team’s production during this decline period has still been above average in aggregate, a closer look at each game tells a somewhat different story. Of the 134 runs scored since April 25, almost 28% (37) have come in three games, meaning the team’s average in all others has been 3.7 runs. Obviously, negative outliers can’t simply be dismissed, but doing so helps to reveal a level of inconsistency that gets lost in the season totals. As illustrated in the chart above, the Yankees’ offense has produced uneven results over the last month. That’s why even the already low 4.6 run average doesn’t really explain the extent of the lineup’s slump. Perhaps most telling is that in almost 80% of the last 29 games, the offense has produced five or fewer runs, a season-long level not seen since the 1960s. Considering that the Yankees have a .380 winning percentage in such games since 2000 (.397 in all such games since 1903), the offense’s recent left leaning run distribution is worthy of concern. 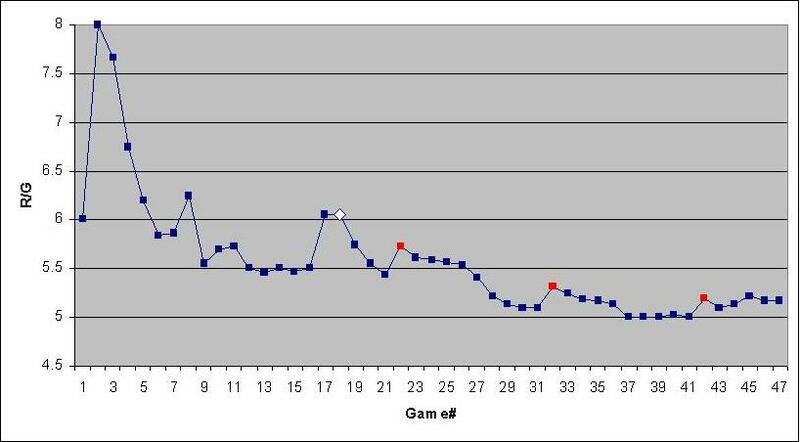 One final illustration of the Yankees’ offensive decline is depicted in the running average graph presented below. Although a downward trend from inflated early season totals isn’t unusual, the Yankees’ output has experienced a steady decline interrupted by the three previously mentioned outbursts (indicated by red dots on the chart). At some point, the Yankees will need this trend line to head permanently in the opposite direction if the offense is going to re-emerge as the dynamic force most observers expected (with the Yankees leading the Blue Jays 7-3 at the time of this post, perhaps that reversal of fortune is happening now). Note: Red dots indicate three games of at least 12 runs. White dot indicates 4/25 “turning point”. Just like in the stock market, past performance doesn’t guarantee future results. So, the point of this analysis isn’t to suggest that the Yankees’ offense is in an irreversible downward spiral, nor imply that the lineup, even in its current state, isn’t still among the best in baseball. In fact, most of the data presented proves that latter point. 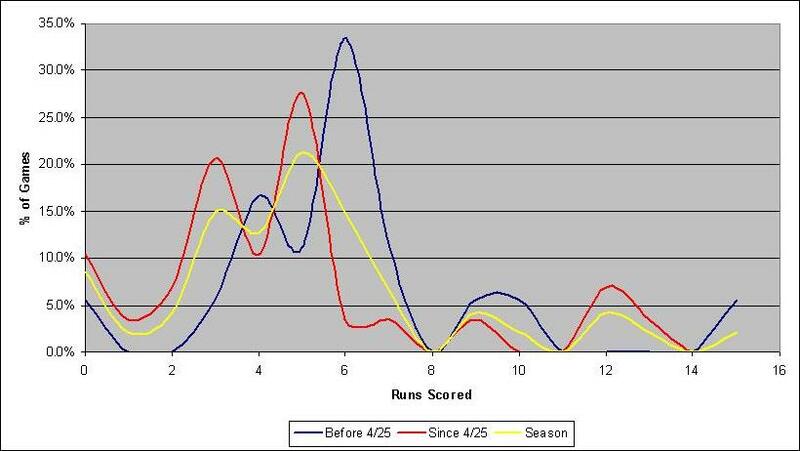 However, this segmented look at the season does a better job of indicating the lineup’s current state than the recitation of season-long averages. Now that we know when the Yankees’ offense started its decline, the bigger question of why remains. That’s something I’ve tried to answer before (here, here, and here), and although any combination of those theories could be a contributor, there are likely many more factors to consider. One additional theory, which coincides nicely with the identification of April 25 as the turning point, revolves around the suggestion that opposing teams had developed a new plan of attack against the Yankees’ power-laden lineup. According to the reports, opposing pitchers are being instructed to feed the Yankees’ batters a steady diet of off-speed pitches. But, what do the numbers say? From 2006-2010, 60.7% of the pitches thrown to Yankee hitters were fastballs. This year, however, the lineup has only seen 57.1% fastballs. What’s more, the decline in fastballs becomes more pronounced as the splits grow nearer to the present date. Considering that the lineup has excelled against the fastball and struggled against most other pitches, this adjustment seems to have had at least some negative impact on the team’s offensive performance. Whether or not there has been a concerted effort to avoid throwing fastballs, it’s evident that opposing pitches have been reticent to challenge the Yankees’ hitters. So, maybe an adjustment by the opposition has been a significant contributor to the team’s lower run production? If so, a revival by the offense will likely require a counter adjustment to this new mode of attack. All things remaining equal, the Yankees’ offense remains potent enough to carry them into the postseason. However, just like there is no guarantee that the offense will continue to struggle relative to its earlier performance, we can’t assume the starting rotation will continue to exceed expectations. That’s why it’s important for the Yankees’ offense to rebound to a league leading level, rather than settle in at a notch below. Otherwise, Brian Cashman could find himself in the market for a hitter instead of, if not in addition to, a starting pitcher.